DOVER, Del. (AP) — Jimmie Johnson put the brakes on a small spat with Martin Truex Jr., with an apology in the form of kids bicycles. 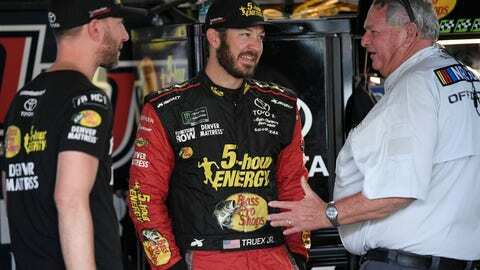 Johnson, the seven-time NASCAR champion, tried to get the last laugh on a last-lap wreck last week at Charlotte that cost Truex a victory. Truex’s crew chief Cole Pearn told Johnson he could make good on the mistake by buying the afflicted team road bikes. So Johnson bought a few bikes Saturday night. Johnson documented the joke on social media. He placed the bikes on the lift of Truex’s hauler at Dover so the Furniture Row Racing team would see them when they got to the garage on race morning. Pearn appeared to give the bikes away to kids walking in the garage because there was no room in the hauler to bring them back to the race shop.